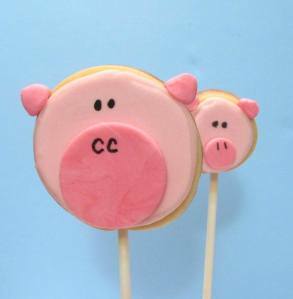 I realized after making these that the concept of a pig’s head on a stick might elicit not-so-cute images. (Is it Lord of the Flies I’m thinking of?) But alas, pig cookies are still sort of cute. And the first cookies I’ve made in my new, temporary kitchen, thanks to the ridiculous kindness of friends who are putting us up between houses. I do ask you to bear with me, (hmmm, bears, I’ll do bear cookies next) as most of my things are in storage or stacked in a precariously tall tower in aforementioned kind friends’ basement. And bonus! 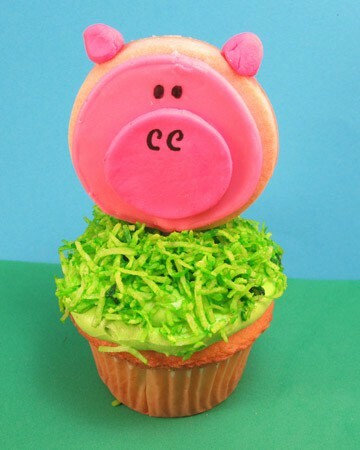 Scroll to the end to learn how to make these pig cupcakes using the pig cookies on a stick. 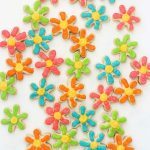 notes: lollipop sticks, the bags, couplers and tips, the cutters and maybe even the gourmet writer should be available at any major craft store. You can of course use any coloring, but I prefer Americolor. 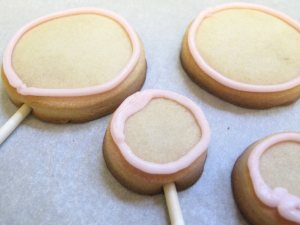 I experimented with different size circle cutters, but you only really need 2 (one for the head cookie and a smaller one for the fondant snout). Prepare a frosting bag with a size 4 tip. 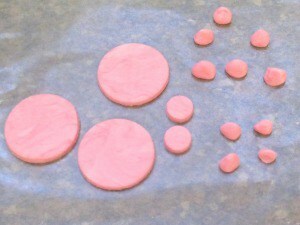 Tint frosting light pink (use only a drop or two of Electric Pink) and fill bag, reserving about half your frosting. Tie closed with rubber band. Outline the circles with pink. Let set a good 15 minutes. 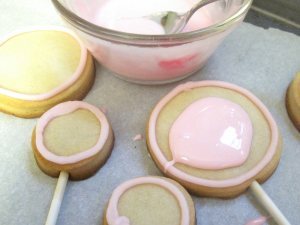 Thin the remaining light pink frosting with water, 1/4 teaspoon at a time, until it is of a syrupy consistency. 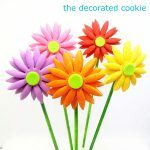 Pour a small amount in the center of each circle and spread to fill the circle with a small knife or spatula. Let set very well, a couple hours at least. 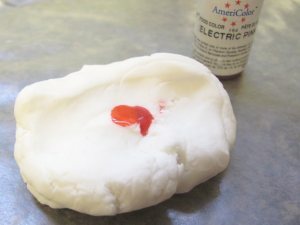 Add a few drops of Electric Pink to a palmful of rolled fondant and knead very well. I colored the frosting to be a bit darker than the head. 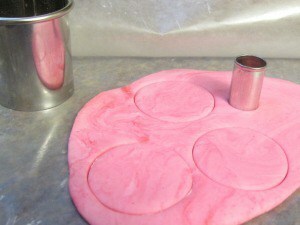 Roll fondant between two pieces of wax paper thinly. 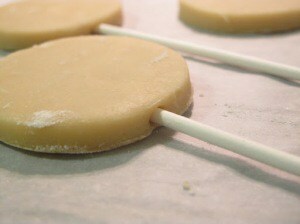 For snouts, cut out circles, pull away fondant, and let set until hard, at least a couple of hours. 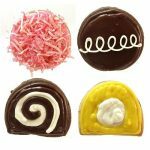 (For 2 1/2 inch cookies, I used 1 1/2 inch fondant circles, for 1 1/2 inch cookies, I used 1/2 inch fondant circles). 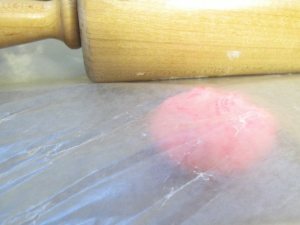 For ears, take a pea size bit of fondant and roll into a sphere. Hold between thumb and forefinger and press onto wax paper to flatten one side. (Leave on wax paper to dry). Pinch top of sphere to form a little triangle. When everything is dry enough to work with, dip your finger in light corn syrup and dab on the back of a snout circle. Press gently but firmly onto the pig head. Repeat with the rest of your circles. Dab corn syrup on the flat side of the ears and attach to head. With marker, draw eyes and nostrils. I can’t wait to bake something from the book. See above to make pig cookies. 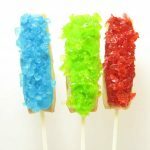 Place shredded coconut in a sealable baggie and add a few drops of green food coloring. Shake the sealed back well to tint the coconut. 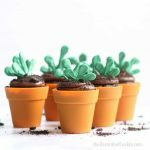 Top cupcakes with frosting that has been tinted green. Immediately press the green coconut on top of the icing. 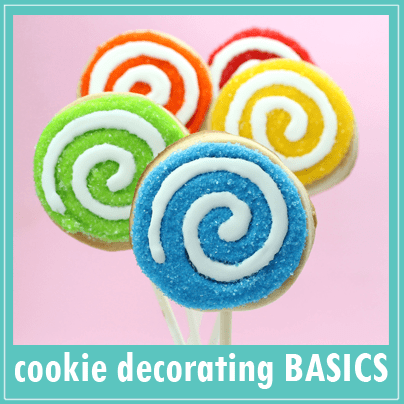 Simply insert the lollipop stick into the cupcake. Hurray! 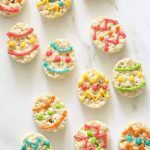 You’re back:) I love your blog and have been so excited about my success with the melted snowman cookies. I got your book and check everyday to see if another new cookie has been added. This blog thing is addictive! What a great way to make me smile! How could anyone ever bear to eat one. Welcome back by the way – you were missed! Glad to see you blogging again! I’ve been checking daily too! Good luck in the house hunt! Be sure to bake LOTS of cookies for your very kind friends that are putting you up while you are between houses! Yes, I think they should receive a lifetime supply of cookies! I won’t lie to you. It was the Lord of the Flies comment that drew me in. As opposed to the cookies themselves. Cookies and all things literary vie for my attention, so the accidental Lord of the Fliesness of these must’ve been inevitable! How cute! Those are adorable. This is such an adorable idea! 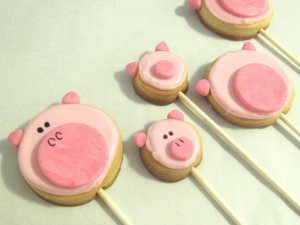 Lol I couldn’t help but laugh at your reference, I still think the piggies on a stick look pretty cute :). 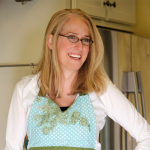 I’m from the Memphis area originally, where we seriously love our barbecue and all things involving pork fat. 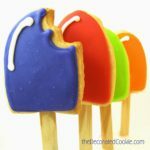 Pig cookies on sticks– yes please! These are adorable.I took a photo while I was home for the holidays of a pig shaped wire form wrapped in lights that was grazing in a neighbor’s yard. Needless to say, these cookies don’t seem the least bit odd to me! Thanks for sharing them! OMG I love these! They are so CUTE!! Thanks so much for this wonderful idea! 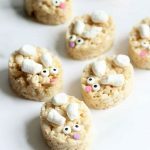 I Googled "pig cookies" and found this site. I teach second grade, and needed a good follow up to "Charlotte's Web" (and last day of school treat) for my students. 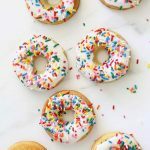 Though I made them slightly differently (due to time constraints), they were a huge hit! I've really enjoyed looking over all your ideas. Thanks!